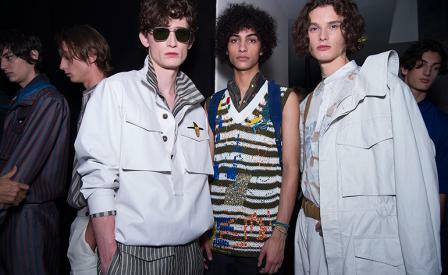 Mood board: Part outdoor expedition, part indoor leisure, Ferrgamo’s spring show was 100 percent new urban cool. A terrific palette and great separates with chic, sharp military touches were pumped up with perfect styling. Best in show: The tree was ripe for the picking in this show that burst with covetable items for spring. Most of all, we loved the wide leg trousers that were impeccably cut in silky, puddy coloured wool or in a chic muted stripe of cornflower blue and brick red and worn with a matching blouson. Finishing touches: Sometimes all you need is terrific styling to beef up great looking classic pieces. This season, knit sweaters hung off belts like cool fanny packs. Linen or canvas rucksacks were cinched with leather straps and printed silk scarves gave the perfect finishing flourish to the off-duty looks.